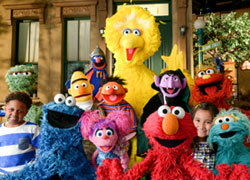 Discussion in 'Classic Sesame Street' started by Barry Lee, May 11, 2003. Does anybody know what skits she was in any body have pictures of her and what years was she ont he show? I miss her she is realy cute. What's the Ernestine that you know? This one is Ernie's cousin. This is the c. 1988 version. First off, the one Ernestine I know of is Ernie's little niece. So Scarecroe, if you have some other information as to a second Ernestine, please share with the rest of the class. Secondly, there are two sketches I know of where Ernestine appeared. 1 Ernie has Ernestine with him and tries to teach her to say his name. He keeps at it, even breaking down his name into two syllables and banging two small blocks to get his niece to say "Er-Nie." But no matter what, she just won't say his name. Then Bert enters the room and closes the door behind him. We hear Ernie's classic greeting of "Hey Bert!" and then we promptly hear Ernestine say excitedly "Bert!" Guess she inherited some of her uncle's ability to frustratingly annoy others. 2 The other sketch involving Ernestine was one where Ernie tries to find similarities between the two of them and describes what she looks like, sort of. He says that these are the following differences. Ernie: I'm a boy and Ernestine's a girl. I have dark and funny hair, and she has light (blonde) and curly hair. She wears a bonnet and I don't wear a hat. I'm wearing a striped shirt and hers is plain (probably light blue or yellow). And of course I'm big and she's little. So no, I just can't find many things that make us the same, but I still love her. And then he laughs his Ernie-laugh, followed by Ernestine who lets out the same laugh. 3 There's probably a sketch with Baby Ernestine, Ernie's niece, and Lily Tomlin's character of Ernestine the Telephone Operator, but I'm not sure as to such a sketch existing nor what happened should it exist. Third, there's a picture for people to color in of Ernestine in the coloring book, the New Who's Who on Sesame Street which I have as part of my collection. So Scarecroe, if you have some other information as to a second Ernestine, please share with the rest of the class. Like I said, it's his little cousin. She laughs like Ernie. That's about it. wait, could that be Baby Natasha? Who was she linked to? Who was she linked to? Maybe we should send a picture of Baby Ernestine to the Sesame Street Encyclopedia. Tommie would feel excited about this. Before we add Baby Ernestine, I would like to know who Byron is referring to. I know that! Lol! I meant Baby Natasha! YES! I was right, that's who I meant! Thank you! Byron, if you're asking who's Baby Natasha's parents, then here's the answer: Humphrey and Ingrid who most notedly worked as clerks at the Furry Arms Hotel. BlueFrackle, now that we know which baby Muppet Byron was refering to, Baby Natasha, can we add the pic of Ernestine to the encyclopedia? Hope this helps and have a good night. I wasn't askin' about Natasha's parents, BlueFrackle was askin' who I was askin' about. LOL! But thanks for the info, I actually didn't rully know anyway. And I saw the words "Muppet Byron" in your post at a glance, and if you take that outta context, that's funny. 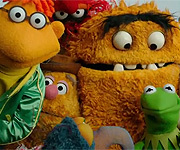 Cause I ain't no Muppet, and there ain't no Muppet version of me. So Byron, by the inference from this post made earlier, were you or weren't you asking who Baby Natasha's parents were? Oh, and you misread my earlier post. I said that now that we knew which baby Muppet you were talking about if we could then have the pic of Ernestine added to the encyclopedia's archives. Hope this helps clear up any confusion and have a good day. Well, I think I thought she was a major character's niece, like Ernestine. But now I know, thanks! WHo performed Ernestine... I'd like to say Richard Hunt, but that's probably wrong! From listening to that Sound File Scott posted, Id say Jerry. No, I think Kevin Clash performed her. I've heard that she is one of the special muppet guest stars that will appear on the new Play With Me Sesame season from Season 2 stating June 7th.